It's time to refresh your mind with this simple, yet immensely addictive tapping game. All you have to do is find the identical multicolor dot from the top of the screen before it changes. See how many dots you can find in 90 seconds. 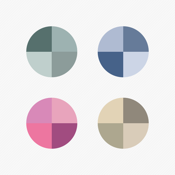 Dots is totally FREE, so why don't you download it and see how fast you can find the colors! Compatible with iPhone 4, iPhone 4s, iPhone 5, iPhone 5c, iPhone 5s, iPad 1, iPad 2, iPad New, iPad Mini, iPad Air, iPod touch (3rd, 4th & 5th generation). Requires iOS 6.0 or later. If you love this game, please support it by leaving a review in the app store so we can continue adding new features and improvements. Thanks for your help!